Camp will fill up fast, be make sure to save YOUR spot for training with the pros! Our counselors are among the BEST. BMX Olympians, Former World Champs, National Champs, USA Cycling National Jr. Team Members, AA Pros, Elite Women. THE BEST! 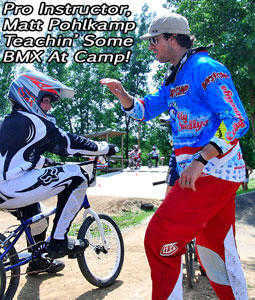 Since 1996, BMX Mania Dot Com has promoted and run the BMX Mania Pro Training Camp, giving hundreds of BMX racers the best in BMX Training from some of the best pros to throw a leg over a BMX bike. Hire Park is one of the coolest tracks in the United States and located in the "Lake City" area of Northern Indiana, a lake's vacation destination for thousands around the Midwest. This is your invitation to come and join us this year at Hire Park for one of the greatest Pro Training Experiences in the world of BMX! Pro Training Secrets - Keeping your bike RACE READY - Cool BMX training games – And lots more! Multiple Camper, Family and Team Discounts available! Check, Credit Card or Money Order accepted! HOLD YOUR SPOT NOW WITH PRE-REGISTRATION DEPOSIT! ______“Hey, Jerry! Hold my spot at the BMX Mania Pro Training Camp, I want to go, here’s my $100 deposit! To hold your place at camp, cut off this form and send it along with a check to…..